* Table Easel box with carrying handle DELUXE ACRYLIC KIT. 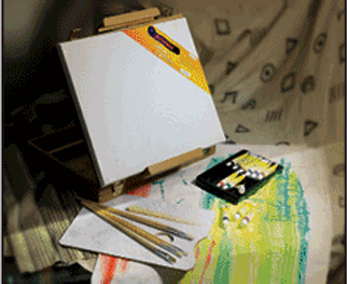 * The upper and lower canvas supports are both adjustable and holds a canvas up to 17.7" size (45 cm). * Includes 1 stretched canvas 11.8 x 15.75" (30x40 cm). * 24 pcs of 12ml Acrylic color, 4 art brushes size 2, 4, 6, 8 and one plastic palette knife.